Applying ethics rules to real-world litigation can be daunting. Your clients want you to push the limits. Technology speeds everything up. And every time you open the Law Journal it's filled with malpractice cases, fee battles, pay equity claims, disqualification motions and partnership disputes. To understand your obligations and manage all the risks you need to keep up with new rules and opinions. 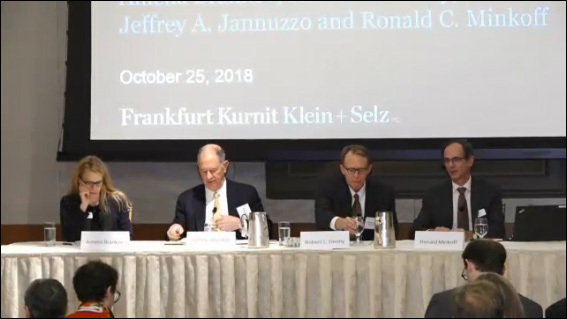 This Litigation Ethics Summit presented by Frankfurt Kurnit Klein & Selz, will identify and explain the hot topics and what triggers your exposure. The program is designed for corporate counsel, law firm general counsel, partners with responsibility for law firm compliance and risk management, and other lawyers with interest in professional responsibility issues. Jeffrey A. Jannuzzo is a solo practitioner in New York, who started off defending legal malpractice cases, but then re-aligned his practice in accordance with truth, justice, and the American way, and moved over to suing law firms whose sloppiness or perfidy caused harm to their clients. He now represents clients against their former law firms in high-stakes malpractice cases. Jeff measures his success by the caliber of the firms that are hired to oppose him: Williams & Connolly LLP, Simpson Thacher & Bartlett LLP, Cravath Swaine & Moore LLP, and so forth. In plaintiff-side malpractice cases, the largest amount at issue was in nine figures for patent law malpractice; the case was settled confidentially. Leviton v. Greenberg Traurig. The decision of the Court of Appeals in Melcher v. Greenberg Traurig regarding claims for attorney deceit was a case of first impression, and reached back to ancient English law of the 1200's to arrive at its result. On the defense side, the Court of Appeals decision in Darby v. Darby v. VSI protecting lawyers against a certain type of malpractice claim has been cited in case law 106 times, and in secondary sources 114 times. Of his 30 reported NY appellate cases, Jeff has won 25, tied two, and lost three. He has been named a “Super Lawyer,” which means he can now get on any subway in New York, if he has a metrocard. In another life, in the late 1980’s, Jeff lived and practiced law in Saudi Arabia, where he was among other things outside counsel to the U.S. government on military construction litigation. His op-ed essay in the Wall Street Journal shortly after the end of the first Gulf War was coincidentally the template of UN Security Council Resolution 687, which created the UN commission for Gulf War claims. Jeff is a 1976 graduate of Yale Law School. Robert Denby is Senior Vice-President Loss Prevention with Attorneys’ Liability Assurance Society, Inc. (ALAS), based in Chicago. In that capacity, he heads the Loss Prevention department, a group of 11 lawyers who spend their time writing, lecturing, and consulting about matters of professional responsibility, ethics, and claims avoidance. He graduated from the University of Chicago with honors in 1986, and then received his J.D. with honors from the University of Michigan in 1989. Upon graduation, he joined the Chicago law firm of Jenner & Block. He remained there until 2000, becoming a partner in the litigation group in 1997. At Jenner & Block, Bob concentrated on trial practice both in complex civil and criminal matters. In 2000, Bob joined the in-house law department at Ameritech Corporation, now part of AT&T. He stayed there for approximately three years, and for the last year ran the Ameritech litigation department, which had a staff of 25 and oversaw an extremely active litigation docket. He joined ALAS in December 2002.